In the days when Jazz was young and largely a Black American Art, before it became an American Art, that is, Dave Brubeck was one of the most skilled white men to practice it and indulge in its intricacies; also becoming one of most respected white artists among the pantheon of largely Black American artists. Even the great Charles Mingus considered Mr Brubeck one of the finest men to grace not only the piano, but all of music – Jazz music – in American and the world. Mr Brubeck gave back in many ways; mostly “in kind” with music that came to be among other things rhythmically iconic. The Brubeck Dynasty continues to thrill audiences across the globe with Mr Brubeck’s sons two of whom make up the brilliantly dynamic Brubeck Brothers Quartet. And this live album Timeline is proof of not only the longevity of the music of Mr Brubeck, but of the magic of the Brubeck Brothers Quartet who make music at the highest level of the art. Timeline is an album that celebrates the 60th Anniversary of the original Dave Brubeck Quartet’s State Department Tour as official Jazz Ambassadors, a title that was shared legends Louis Armstrong and Dizzy Gillespie among others. But that tour of 1958 took Dave Brubeck and his men across Europe and Asia and as the maestro traversed the cultural topography of the world he absorbed many influences one of which resulted in a musical collision between America and Turkey that came to be called “Blue Rondo a la Turk”. It is this seminal rhythmic wonder that opens this magnificent album. But if you were expecting something close to what the Dave Brubeck Quartet played on the legendary Time Out (Columbia, 1959) that resulted from that Eurasian tour. This version is a breathtaking re-imagined one of the Brubeck Brothers Quartet’s invention – complete with Dan Brubeck’s hand drums and other percussion – and it becomes a small percussion ensemble one in itself. Naturally the musical focus of Timeline remains that historic tour that came at the height of the Cold War that came after the Second World War and so the repertoire on this album features music that was inspired by and written for or about the places that were visited during that incredible event. The Brubeck Brothers also perform their father’s poignant miniature “Thank You (Dziekuje)”, inspired by a visit to Chopin’s home in Poland a fitting bookend for the album. Significantly the Brubeck Brothers put a twist into the rhythm playing this one in Bossa Nova time. The highly expressive “Since Love Had Its Way” and the beckoning dalliances of “Easy As You Go” also recall their father’s tour. Significantly the sons also recall that Dave Brubeck was deeply affected by the hypocritical manner in which Black Jazz Ambassadors were treated when they returned home to the US and, significantly, this receives mention in the liner notes too; which is important too as Dave Brubeck was – with the revered writer Nat Hentoff – one of the first white activists as Jazz artists go. 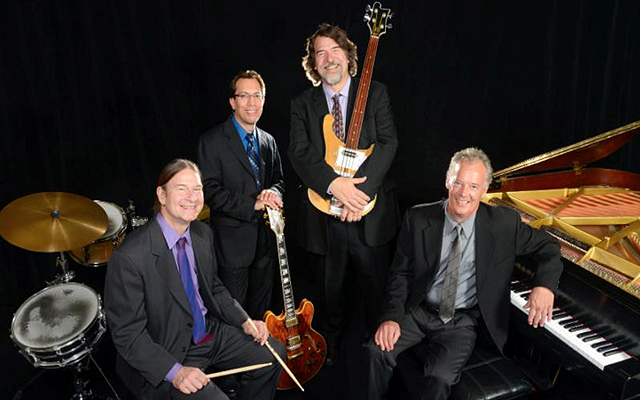 Politics aside, however, the music of Timeline, including original songs written bassist Chris Brubeck, pianist Chuck Lamb and guitarist Mike DeMicco whizz by like a soft hail of pearls that rush, gleam, resonate and bounce in vivid homage to the master, Dave Brubeck, whose own sparkling and vivacious accounts have forever shaped the landscape of Jazz. But these shimmering songs performed by the Brubeck Brothers Quartet make light weather of even the most breakneck writing of their father: rhythms are crisp and buoyant; virtuoso passagework is dashed off with devil-may-care abandon. This is truly impressive playing by any standards. And the generous acoustic (of the recording) highlights the lustrous sound of the instruments – especially of the concert grand piano – without muddying any of the other ensuing instrumental textures.